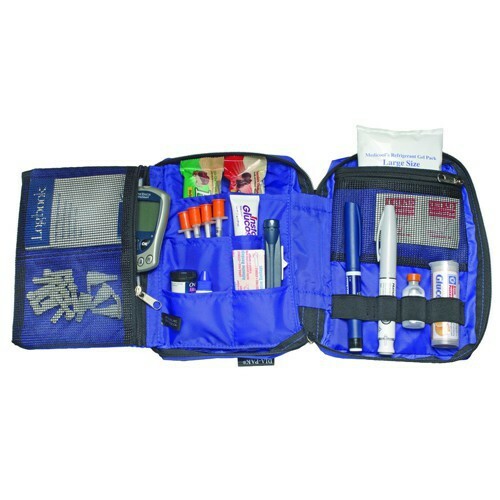 The Dia-Pack Deluxe created by Medicool, is a case designed with pouch compartments where diabetic supplies may be stored. The pouch is built from nylon and can hold up to a 2-week supply of diabetic supplies. The product comes with a cold gel pack which will keep insulin and other diabetic related items cooled and concealed. In addition, the pouch is water resistant and durable while sealed, so whatever accident could occur your diabetic supplies will remain protected and safe. Not to mention, a shoulder strap comes included with the bag allowing you or a loved one to travel outside the home providing more ease and less hassle. If you, friends or other family members are curious to know more other diabetic supplies sold at Vitality Medical. Please consult our diabetic supplies page where products of insulin syringes, diabetes insulin pumps, blood glucose testing and more can be found. Dimensions: 6" x 8" x 2.5"
Has preformed well in the Kansas heat! Holds everything I need and kept all pens cool even when I slipped and left the Dia-Pak in the car. Everything survived, a 107 degree day outside of the car, that was in the car. i am repeating myself, I was exactly as I expected it to be as it was described.